The Anup Jalota Bhajan introduced many to the deep reverence of Mirabai towards Shri Krishna.Such was the faith and devotion of Mirabai towards Gopala that she set an example of giving oneself up in the love of the Lord. 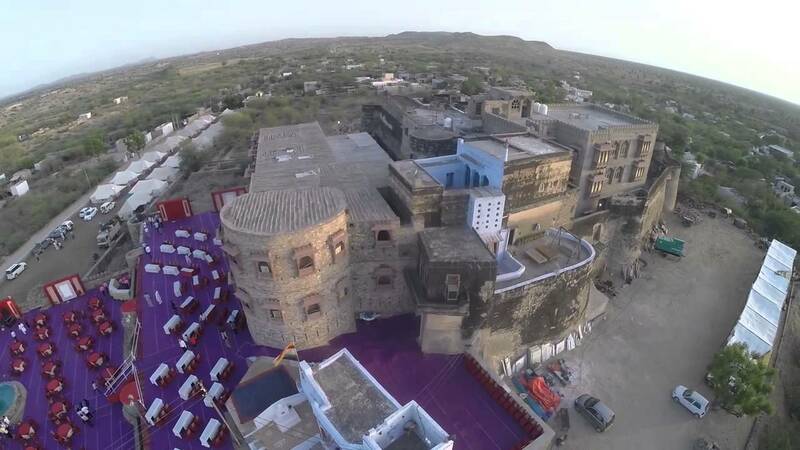 Mirabai was born a princess, a granddaughter of Rao Dudaji — the third son of Rao Jodhaji, who established the kingdom of Rathod Dynasty in Rajasthan, with Jodhpur as its capital in the kingdom known as Jodhpur. Jodhaji gave his son Rao Dudaji a small portion of the Jodhpur kingdom. It consisted of several villages with Merta as its capital. Merta is about 60 kilometers west of Ajmer in the present state of Rajasthan, India.Rao Dudaji had two sons, Viramaji and Ratnasingh. Rao Viramaji had a son named Jayamal and Ratnasingh had a daughter called Mira, whose mother, Vir Kuvari, was the princess of Zola Rajput Sultan Singh. When she was just four years of age on watching a marriage procession Meera, the child, asked her mother innocently, “Dear mother, who will be my bridegroom?” Meera’s mother smiled, and half in jest pointed towards the image of Sri Krishna and said, “My dear Meera Lord Krishna is going to be your bridegroom”. 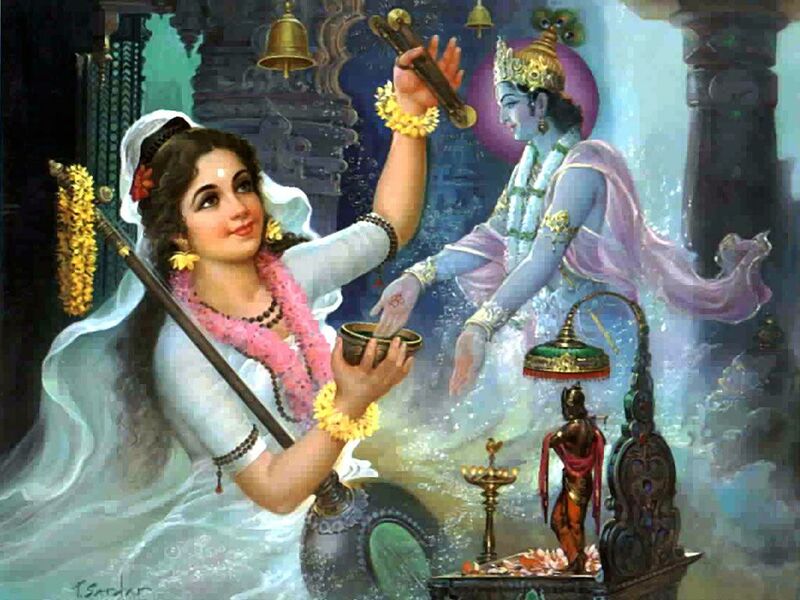 She manifested a deep devotion to Sri Krishna. She lost her mother soon. Her mother passed away while she was still about 5 to 7 years old. Her father Ratnasingh died in a battle defending the kingdom against the Mogul Badshah, Akbar. Thus, Mirabai had experienced very little affection of her parents. However, Rao Dudaji, her grandfather, raised her with love. It is said that little Mira would play in his lap as he conducted the business of his kingdom with his ministers and advisors. Mira was a beautiful child-princess and the beloved of everyone who came close to her. Ever since her mother commented about Sri Krishna and the parade Mirabai began to play with and think of Krishna as her Beloved Husband. One day a sadhu visited her family. Mira saw a beautiful little Murti (Idol) of Sri Krishna with the saint. She saw he held it very close to his heart, worshipped it, pronounced mantras in front of it, sang songs and even danced in front of it. Mira watched the sadhu’s joy as he worshipped the Lord in that icon. She wanted to have that icon for herself. She insisted, like children often do, that she wanted to have that icon of Shree Krishna. She cried until Rao Dudaji requested the sadhu give the icon to Mira. He promised the sadhu he would make arrangements to get him another Murti. With a reluctant mind, the sadhu gave the murti to Mira and taught her how to worship the Lord. Mira was delighted and paid meticulous attention to the details of worship. Mira was the darling of not only her uncle Viramaji, her cousin brother Jayamal, and her grandfather Dudaji, the ruler of Merta, but she was also the darling of sadhus, ministers, elders and the entire kingdom. She was also the most loved in Kudki, her birth place. Though she was the most beautiful and delightful innocent girl of the kingdom, she was never arrogant towards anyone. 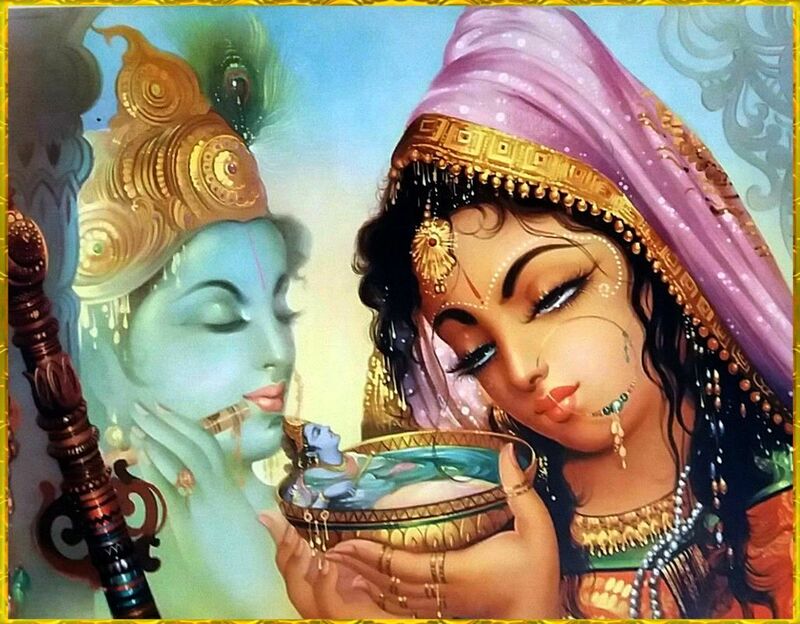 She never forgot her singular goal of loving her Eternal Bridegroom, Krishna. He was a toy to play with and to sleep with; she fed him, adorned Him with clothes and ornaments. She sang loving, sweet songs to put him to sleep like a little girl would do with her choice doll. Thus, her days passed in loving play and devotion to the Lord. She was unmindful of upheavals in the Rajput families due to their disunity and wars with the Moghul Emperor, Akbar. As she approached the age of sixteen, circumstances beyond her choice arose. The Rajput kings were always struggling to be united among themselves to fight the Delhi­-Ruler, Akbar. The most powerful and respectful Rajput king, Sangramsingh (Sangaji) of Sisodia Dynasty, was ruling the kingdom of Chittorgarh. There was no love between him and the Merta kingdom or the Jodhpur kingdom. However, he decided to mend the relationship with them for the ulterior motive of creating a temporary unity required to defeat Akbar. In those days, the most common means to such unity was to create a relationship through marriage. Rana Sangram Singh (Rana of Mewar) had four sons: Kumar Bhojraj, Rana Ratnasingh, Rana Vikramajit and Rana Udayasingh. Rana Sangram Singh proposed the marriage of his Prince Kumar Bhojraj with Mira, thus, tying a knot between the two most powerful kingdoms of the Rajputs. Unfortunately, girls had little say in their marriage in those days. The Rajputs were shortsighted and selfish. They sought the advice of dharma gurus who were ritualistic and ignorant of the Truth. Mira was married off, against her wishes to Prince Bhojraj of the Sisodia. After a forced marriage she did what any wise young lady with true faith in Krishna would do. She refused to let Prince Bhojraj touch her because she considered herself already married. She considered herself the faithful bride of Sri Krishna. At first, nobody in the Sisodia family took Mira’s strange behavior seriously. They hoped in vain that she would eventually give in knowing that no one dared to displease the mighty Sisodias. There was persuasion; there were threats; there were attempts to cause her suffering and there were even attempts to kill her. It’s well known that in the family life of such a clan most in-laws would take revenge on Mira for her disobedience and non-compliance. Her husband and father-in-law had a soft corner in their hearts for Mira, but not to the degree to approve her behavior, which contradicted their religious traditions. Mira even ignored the advice of their dharma guru, which the Sisodia family could not tolerate. Mira was, after all, a powerful Rajputani. She didn’t allow any unwarranted interference in her spiritual life. The young Mirabai had already embarked upon the internal, spiritual journey that would pervade her life and raise her in future centuries to the status of near-divinity in India. Her disinterest in matters corporeal was of a piece with her rejection of the princely luxuries to which she was born. Bhojraj was nonplussed by her detachment and is said to have initially attempted to pull her back into worldly affairs. He is said to have found Mirabai’s detachment and personality fascinating. By many accounts, Bhojraj and Meerabai enjoyed a relationship of friendship and understanding, with Bhojraj appreciating Mirabai’s poetic talents and indulging her wish to have a temple build to Sri Krishna within the palace complex. It is said that her sister-in-law Udabai conspired to defame the innocent Mira. She informed Rana Kumbha that Mira was secretly in love with someone. Kumbha ran with a sword in hand towards Mira but was calmed down.With his sister, he went to the temple at night broke open the door, and found Meera alone in her ecstatic mood talking and singing to Krishna’s idol. He shouted, “Meera, show me your lover with whom you are talking now”. Meera replied, “There sits He —my Lord She stood unruffled in the face of accusations of immoral character and said that she was married to Sri Krishna.Her husband was heartbroken but he remained good and sympathized with her until his death. Bhojraj died in battle in 1526. His death had a profound effect on Meerabai’s life, for she lost both a friend who had kept her interested, however tenuously, in worldly affairs; and a patron who had protected her from criticism and rebuke within the family while indulging her eccentricities. Bhojraj left no children and was succeeded as heir apparent of Mewar by his younger brother, Ratan Singh.This led to her subsequent exile was ordered by Bhojraj’s younger brother and successor. Legends have it that several attempts were made to get rid of Mira. She was sent a basket with a cobra inside and a message that the basket contained a garland of flowers. Meera opened the basket and found inside a lovely idol of Sri Krishna with a garland of flowers. She was sent a cup of poison saying that it was nectar. Meera offered it to Sri Krishna as Prasad. It was real nectar to her. The bed of nails that Rana sent transformed into a bed of roses when Meera reposed on it. In another version of these legends, she is asked by Vikram Singh to go drown herself, which she tries but she finds moment floating on water. It is said that when the torture and scandals continued, Meera sent a letter to Tulsidas and asked for his advice. Tulsidasji sent a reply: “Abandon those who cannot understand you.The relation with God and the love of God are the only elements that are true and eternal; all other relationships are unreal and temporary”.She went into the slums often to be in the Satsang of this great teacher. When all attempts failed to get rid of Mira, the Sisodias finally decided to send her to her parental home. Mira was always prayerful, humble, gentle and firm in her determination and didn’t allow even the worst circumstances to interfere in her love for Lord Krishna. She left Chittorgarh, stopped in Pushkar to take a holy bath and reached Merta. The situation in Medta was no better; constant wars had created an uneasy situation and she could not stay there either. She finally decided to leave for Vrindavan where her beloved Krishna had played with the Gopis and Radhika. In Vrindavan, she went to a sadhu who was considered the most knowledgeable person about God. But the sadhu refused to see her because he had vowed not to see any woman. As she started to leave the place, Mira responded that she did not know there was any man in Vrindavan other than Shree Krishna (everyone is considered a gopi — male or female — to play with the Creator, Shree Krishna). The sadhu realized his ignorance, came out of his hut and bowed down to Mira. Mira pardoned him and continued on her way. After her stay in Vrindavan, enjoying and reviving gopi-lila in her own way, she left for Dwarka in Gujarat. Lord Krishna, once the king of Yadava family, had ruled over Dwarka. On her way to Dwarka, she stopped at Dakor which was known for its Krishna temple. Mirabai arrived in Dwarka and decided that her life must become one with her Lord. Her family realizing their folly sent some Brahmin priests to invite Mira to return to Merta or Chittorgarh. Mira, however, was too absorbed in her Love for Sri Krishna and having seen the vanity of worldly life, family life, friends and others, she had abandoned any hope to reconcile with the worldly. It is said that the Lord finally absorbed her in Him at the Dwarka temple. Mirabai was a born poet. She expressed her deep devotion to Shri Krishna. 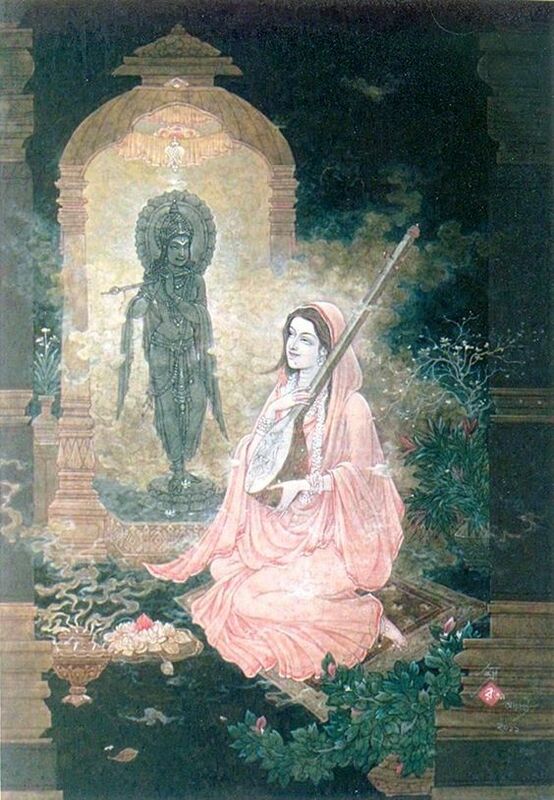 With her ektara in hand, she sang hundreds of kirtans that she composed each full of piety, love, and dedication. Even today many people still sing her kirtans. Although she was a queen, she traded all her riches to worship Shri Krishna Bhagwan. In her poems, Sri Krishna is a yogi and lover, and she herself is a yogini ready to take her place by his side unto a spiritual marital bliss.Meera’s style combines impassioned mood, defiance, longing, anticipation, joy, and ecstasy of union, always centered on Krishna. Meera speaks of a personal relationship with Krishna as her lover, lord, and mountain lifter. The characteristic of her poetry is complete surrender. After making me fall for you so hard, where are you going? Until the day I see you, no repose: my life, like a fish washed on shore, flails in agony. For your sake I’ll make myself a yogini, I’ll hurl myself to death on the saw of Kashi. Mira’s Lord is the clever Mountain Lifter, and I am his, a slave to his lotus feet. Mira is often classed with the northern Sant bhaktis who spoke of a formless divinity. Scholars acknowledge that Meera was one of the central poet-saints of the Bhakti movement, during a difficult period in Indian history filled with Hindu-Muslim religious conflicts.